Personalize one with your family name, or several to represent each family member. Fiercely loyal and fans of huge hugs: That's your family. 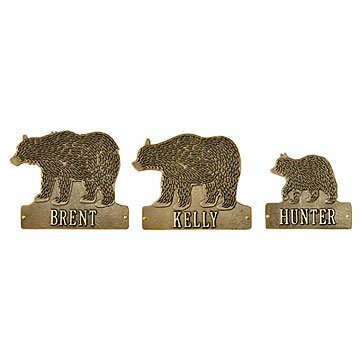 Celebrate your bear of a brood with one or a set of these stately yet playful home plaques. Personalize one with your family name, or several to represent each family member (they come in Papa, Mama, and Little sizes). They're crafted by a collective in Michigan from recycled aluminum using a sand-casting process, and make a thoughtful gift for weddings, new homes, and new baby bears. Hardware included. Handmade in Whitehall, Michigan.